McCarney / McKernan of Manotick (from Belfast area). Looking forward to hearing from you. of the dates though. I do know he left Richmond for Phelpston, Ont in 1864. I still have many relatives there- most of the Doyles went west, though. in Bytown. I have a fairly complete tree of their descendents. much luck in his research. "Barney McCarney" and the park named after him across from the Mill in Manotick. driver from Manotick to Manotick Station around the turn of the century. I'll provide more info in the next few days. with the Wexford Boys in the Revolution of 1798). James Doyle (1846-1932), Philip Doyle (1848-1931), and Teresa Doyle (1850-?). in a little village called Phelpston where he farmed and lived till his death. No Doyles remained in the Ottawa Valley consequently. Phelpston, - this is the line I come from. widow. They had no children. he owned the Doyle House Hotel. And that census image you sent me is very helpful. It would be interesting to know whether my Doyles and yours are related. went back to New Ross, Co Wexford, but he died before I could find out anything. spelled McKernan and McCarney (and McKernin in the 1851 census). have no information on them. it to the web page as well. Someone will probably be researching this family as well. records, etc. However, I'll keep an eye out. Road just south of Manotick and a Catholic Church between Manotick and the Doyle Road. I'll check the cemetery records and see if anything shows up there. is located on the eastern side of the Rideau River, just south of Manotick. Eliza wife of James McCarnen died Nov. 13, 1877, aged 65. County Cavan, Ireland in 1788 and may be the patriarch of these Dolans. His wife was Ann McGovern, also born 1788 in County Cavan. to them but over the years have gathered some info in my records regarding this family. 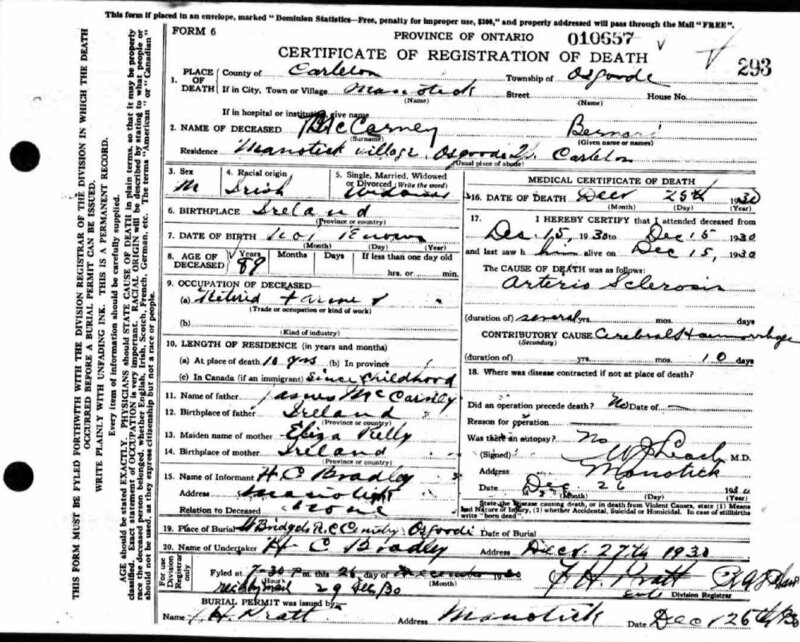 Baptism Dec 22, 1839 Margaret Doyle born Nov 25, 1839 Sponsors Bernard Tooney? them written down but do you know any other names in your Quinn/Doyle connection i.e. Mary's brothers or sisters or parents? Let me know and I'll send additional stuff if I think it links in.